Billy Joe Shaver is getting ready to record and release his first studio album in 7 years, according to the 74-year-old Outlaw country songwriter and performer. Shaver released a couple of live albums last year, Live At Billy Bob’s Texas and the Live from Austin, TX: Austin City Limits – August 14, 1984, but this will be the first album of new material since his 2007 predominantly Christian album, Everybody’s Brother. Shaver, who got his big break in country music when Waylon Jennings’ breakout album Honky Tonk Heroes included all but one Shaver-written song, also couldn’t pass up the opportunity to do a little sabre rattling about the current state of country music. Billy Joe Shaver has had a tumultuous last 7 years. After coming out of a period where his wife, his son and guitar player Eddy, and his mother all passed away in a span of 2 years, Shaver battled a bad shoulder injury, and charges stemming from a shooting at the Papa Joe’s bar near Waco in 2007 that resulted in an assault trial against the songwriter, and a song chronicling the event by Dale Watson called “Where Do You Want It?” Shaver was eventually acquitted when it was found he acted in self-defense, with help from character witnesses Willie Nelson and Robert Duvall. Can’t wait to hear it!! 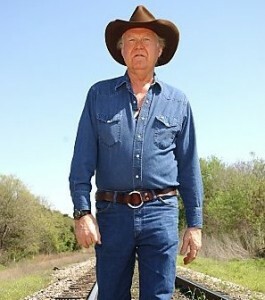 Billy Joe Shaver is a legend! Billy Joe Shaver has been one of my guideposts as I’ve tried to write songs that tell the truth…or mock the devil…I can’t wait to get another dose of inspiration! Now that is an Outlaw. All you need to know is that is talking to the Fort Stockton newspaper. Billy Joe is one of my favorites. I am thrilled by this news. Good Lord! Why did so many of his friends and family die in such short order? That’s just awful. BJS last album “Everybody’s Brother” IMO is one of the most important Outlaw country albums ever written. Heavily laden in spirituality and worship of Jesus Christ, it’s an album of forgiveness. It’s not so much telling you why you should believe in The Lord, but an album of his songs that were written due to his crazy past and realizing that his time here is almost up. Every major Outlaw has thought about writing an album like Everybody’s Brother but never had the balls to record it. I can’t wait to hear what this genius has next for us. Great job Trigg , articles like this keep me coming back. I saw Billy Joe Shaver a few years back when he opened for Loretta Lynn at the Nelsonville Music Festival in Ohio, what a fantastic show! Billy Joe Shaver is the Waylon Jennings of today…without the (teen pop) financial backing. I’m looking and listening forward to some more great music from BJS! WooooHoo!!!!!!! BJ is a great songwriter, right there with Merle and Willie and Kris. This is incredible news and I cannot wait to hear this record, much like the bated breath I had for Guy Clark’s last one. To paraphrase the late, great Bum Phillips, BJS ain’t the only one in his class, but whichever class it is, it doesn’t take very long to call the role. Looking foward do the record been too long. BJS is a legend but more thn that a wonderful man very down to earth. This is truly great news – I can’t wait for it to be released. My favorite BJS album is Billy and the Kid, about his deceased son, Eddy, even though it tears me up to listen to it. I had completely forgotten about his incident in a barroom. He certainly did better than Johnny Paycheck, although the facts were likely quite different.